Here's a real dog of a kit that has more Evergreen sheet than kit plastic. 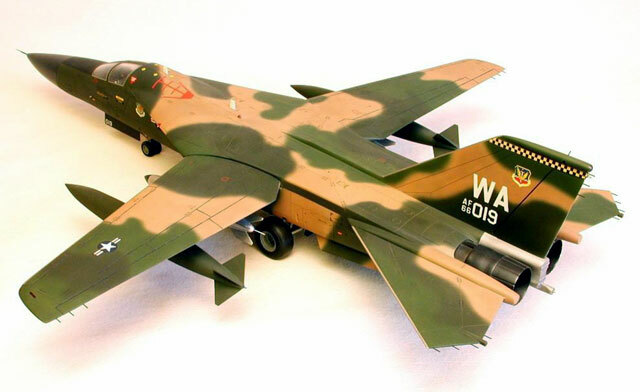 It is the old (and now thankfully) out-of-production Monogram F-111A, corrected as best as my obviously limited talents would allow about 20 years ago. Most of the major gaffs that carried over when Monogram inherited these molds from Aurora involved the nose, windscreen, and intakes plus the usual deficiencies in the detail parts like the landing gear, cockpit, pylons, and ordnance. I lengthened the nose with pieces of a scrap A-7B fuselage then recontoured the whole assembly with multiple coats of CA gel, shaping and sanding as I went. The new windscreen is several pieces sectioned from two Monogram B-29 canopies, glued together to arrive at a semi-correct form. For the intakes, I removed the molded trunks, rebuilt the fuselage behind them, then used the ducts from a second Aardvark kit to approximate the Triple Plow configuration. Since I opted for a closed-canopy model, cockpit detailing was held to a minimum with only the most neccessary items added such as PE buckles for the seat/lap belts, some knobs and handles, and a couple of MV lenses to simulate the various CRTs and displays. The vents over the wing box-beam area were addressed using some PE model railroad grate, while static dischargers on the wings and empennage were added using nylon bristles from an old hairbrush. All exterior lights were replicated using colored Lexan, and when I finally got this monster together, I rescribed the entire surface detail. Hand-massaged hypo needles and straight pins became pitot tubes, AOA transducers, and outside air temperature sensors. I beefed up the landing gear with some extra detailing and replaced the nose wheels with those from an F/A-18 Hornet kit. For the main wheels, I sectioned the wheel hubs from a Revell A-10 into the kit's outer wheel halves then sandwiched .060" styrene sheet between the tire halves to increase the profile. The tailskid and its well were scratch-built from square brass channel and some steel wire. The wing pylons were corrected as per the Detail &Scale book, then I scratch-built new ordnance consisting of the 600-gallon drop tanks and a pair of B-61 "special stores", mated to the pylons with scratch-built sway braces. The 20-mm gun was fabricated from #20 hypo needles and set into its fairing on the weapons bay door, then I added the station 5 pylon on the fuselage between the engines and hung a Hasegawa ALQ-119(V) from it. This build only took a leetle longer than usual (about nine years) and when I had everything dialed in as best as I could, the model was painted with Testor's Model Master enamels and Spray 'n' Plate aluminum for the un-painted metal areas on the leading edges and afterburner fairing. The tailpipes were painted in flat black, then burnished with powdered graphite. 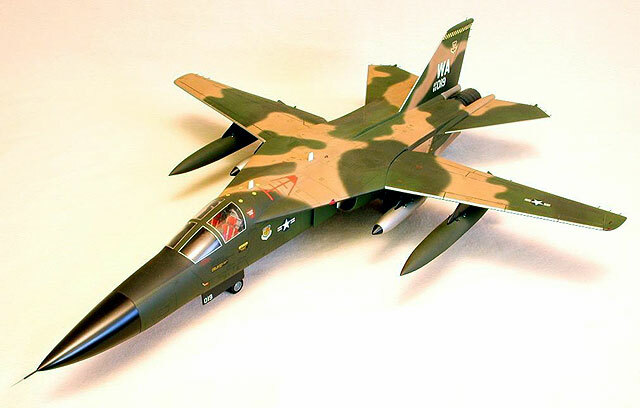 Various MicroScale, SuperScale, and ScaleMaster sheets were used to replicate an F-111A from the 57th FWW at Nellis AFB, circa 1982.